Made in Japan and crafted from porcelain, this cute lucky cat charm features a Maneki Neko—Japanese lucky cat in white wearing a smile with its right paw raised in a gesture of welcome and beckoning to bring good fortune your way. Maneki Nekos are popular lucky symbols in Japan and Asia. The popular folk belief is that Maneki Nekos are beckoning good fortune the way of their owners. 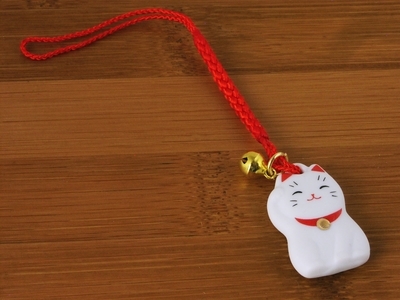 Wearing a cute smile, with red ears, red collar and a lucky gold bell, this lucky cat charm also comes with a matching red loop for hanging this lucky charm on your cell phone, keys, bag, luggage, or flash drive. It is a handy way to add a touch of charm to your personal belonging. A bright gold bell adds a cheerful jingling note and will keep you from losing your keys even as it brings good luck your way. This lucky cat charm comes packaged in a paper envelope, and is a lovely little gift to brighten up the day of someone special.